If Misleading Readers Wasn’t Allowed, What Would The ‘Honest’ Headlines Look Like? If news organizations weren’t allowed to mislead readers about climate science, what would the headlines say? 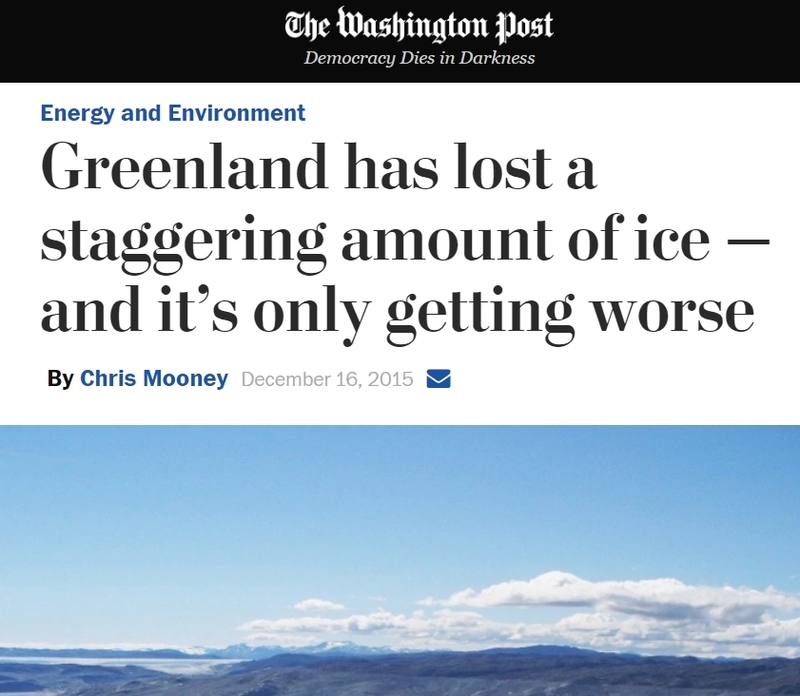 With regard to the long-term (and recent) ice melt records for the Greenland Ice Sheet, a non-deceptive, non-misleading headline might look something like this. Also, for the chronically unaware, here is a graph of the Greenland Total Ice Mass since 1900. (could be some argument about the actual starting value…. 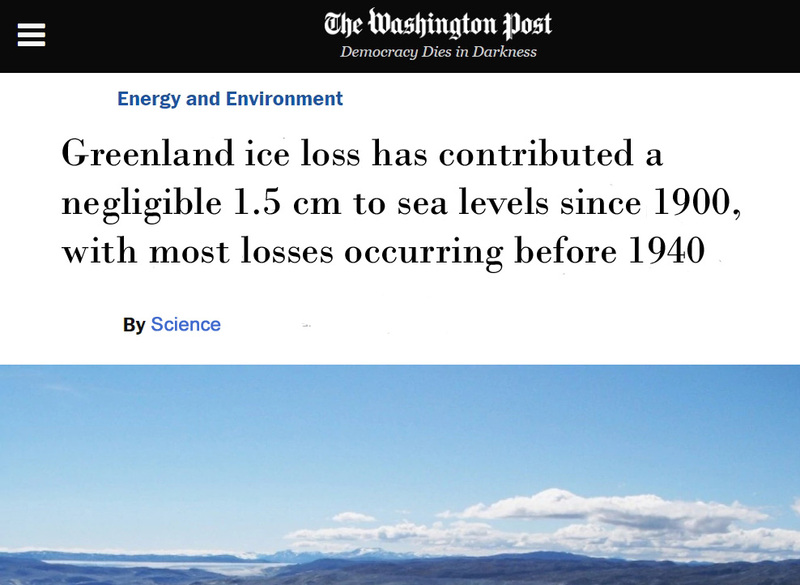 There is absolutely no way they can say with any accuracy just how much ice Greenland has lost or gained in the last century….. since the LIA, btw.. Certainly it looks to have gained this year. And certainly it is still very near its 8000 year maximum. Any amount either way will, in reality, be totally insignificant. Anything before 2012 is just a load of junk. You shouldn’t abbreviate your quotes and leave out essential information, Kenneth. Oh, isn’t everything mostly natural and not unprecedented in your world? So if anthropogenic CO2 emissions, which only began rising to any significant degree after the 1940s, are the main reason why Greenland ice melt has contributed a whopping and “unprecedented” 0.39 of a cm between 1993 and 2010, what is the reason why (a) GIS meltwater contributed 1.1 cm to sea level rise between the 1920s and 1930s (3 times as much meltwater equivalent as 1993-2010), and (b) why did the Greenland Ice Sheet not melt at all (no meltwater contribution to sea level rise) in the ~60 years between the 1940s and 2000s? Identify the mechanism responsible for these trends, SebastianH. Furthermore, why did the ice sheet gain mass between 1961-1990 when yearly CO2 emissions rates doubled from 3 GtC/yr to 6 GtC/yr during these same 3 decades? What was the mechanism forcing the mass gains between the 1960s and 1990s? 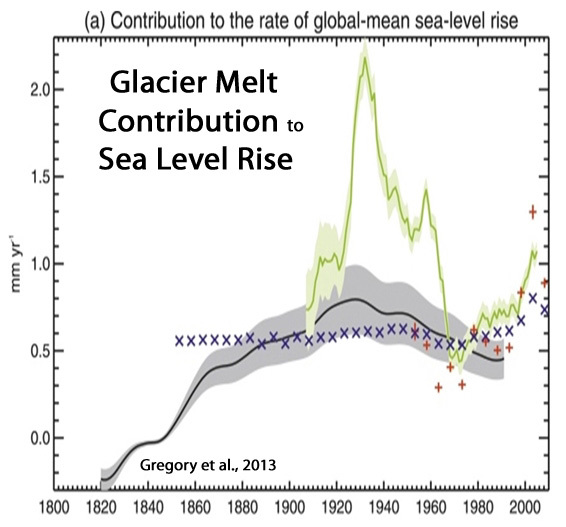 By the way, to reach the conclusion that the recent decades of meltwater contribution to sea level rise is “unprecedented” in the last century, Fettweis et al. (2017) used a very short-term time period to compare to a longer-term time period (kind of like picking an El Nino year to end a temperature trend), and they cite van den Broeke et al. (2016), who only extended their record back to 1958 and did not include the 1920s to 1930s losses. Do you agree or disagree that failing to emphasize what “9 trillion tons of ice loss” in 110 years actually means in terms of sea level rise equivalent (less than an inch) is misleading? Or do you fully endorse the practice of attempting to conceal impacts by using scary wording (Hiroshima bombs of energy!) and pivoting to fantasy analogies (i.e., 1 inch of global sea level rise would submerge the U.S. highway system in 89 feet of water)? Given your track record, I would assume you fully endorse this practice. There is no accurate data about ice mass from before the beginning of this century, is there? Given your track record, I would assume you fully endorse this practice. I do … the average person can not imagine what 9 trillion tons of ice looks like, it’s not even possible to visualize 9000 tons of ice or even how much melted ice would fill a bath tub. That’s why we use expressions like “submerge the U.S. highway system” or “would reach the Moon/Mars/etc if stacked on each other” or “would reach x times around Earth” or “is the size of x soccer fields”. Those “in the know” that can use a calculator can easily see what 9 trillion tons of ice are compared to the whole mass of all ocean water and can roughly say how much sea level rise that would result in. Those “in the know” can also easily determine how much heat content change results in what kind of sea level rise due to thermal expansion, e.g. for the sea level to rise 15 mm (as mentioned above) the heat content has to increase by ~1 * 10^23 Joules … and surprise, it increased by roughly 2 * 10^23 Joules since 1990. 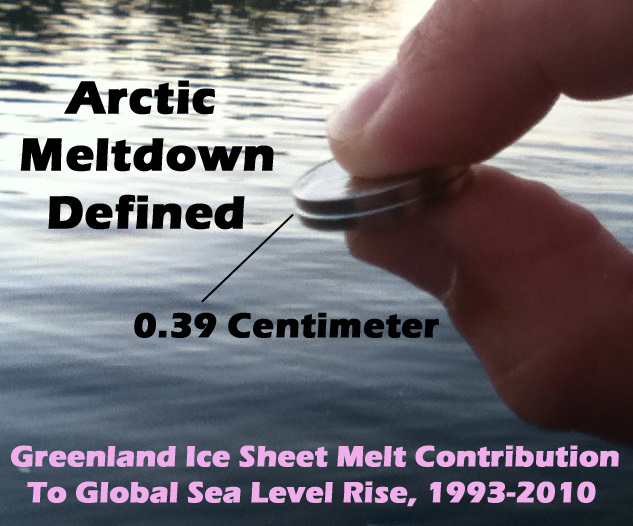 Those “in the know” know that the melting of the Greenland ice is just a small contributor (see chapter 13 in AR5: https://www.ipcc.ch/pdf/assessment-report/ar5/wg1/WG1AR5_Chapter13_FINAL.pdf). Thank you for admitting that you endorse misleading alarmism and fantastical analogies that have no Earthly connection to observed reality. 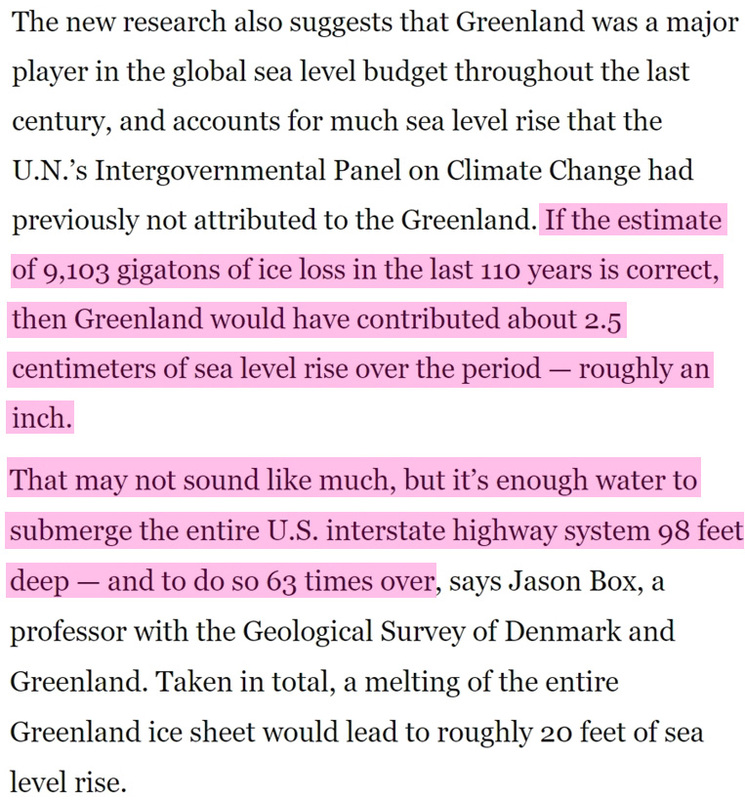 For you, less than one inch of sea level rise equivalent from the Greenland ice sheet over the last 110 years (75% of which was achieved during the 1920s to 1930s) is directly comparable to submerging the U.S. highways with 98 feet of water (times 63). And you wonder why we don’t take your analogies seriously. By the way, SebastianH, you somehow failed to directly answer my cogent questions on this topic. I’ll ask them again (so as to remind you to not avoid them). Let’s see if you will answer these questions this time around. By the way, SebastianH, you somehow failed to directly answer my cogent questions on this topic. Find out the answers to your questions yourself (if you don’t know them already). And why do you think that those reconstructions are accurate? Do we really have data about the melted ice mass of Greenland in the 20s and 30s? Or is it rather derived from a model? I thought you dislike models? All your questions clearly show that you seem to expect me to give you a simple answer similar to “this directly causes that”. Whether or not you actually believe that everything climate related is connected by simple relationships (you definitely do believe it to be the case for the supposed CO2 vs. temperature relationship) is still a bit open, but please note the following: just because CO2 is causing something to happen in today’s climate system, doesn’t mean that it was the cause when something similar happened in the past. Got it? I want to know what you believe, SebastianH. What caused the Greenland ice sheet to expand and thus to reduce global sea levels rather than add to sea level rise between 1961-1990, when human emissions rates doubled from 3 GtC/yr to 6 GtC/yr? What caused the Greenland ice sheet to add 1.1 cm to sea level rise between the 1920s and 1930s, but then 0 cm between 1940 and 2000 and just 0.39 of a cm between 1993-2010? In what way are these rate changes to sea level rise compatible with rates of human emissions? All your questions clearly show that you seem to expect me to give you a simple answer similar to “this directly causes that”. Even if you were to identify what are the potential causes for the “nil” Greenland contribution to sea level rise between 1940 and 2000, when emissions rose from 1 GtC/yr to 8 GtC/yr, that would suffice. But I am not surprised you will continue to dodge it. So what caused the Greenland ice sheet to melt so rapidly and contribute 1.1 cm to sea level rise during the 1920s and 1930s if it wasn’t CO2 emissions from humans? STILL cannot provide the slightest proof for CO2 warming. CO2 is causing NOTHING in todays climate, seb. All you have ever managed to produce is more mindless GULLIBILITY and baseless anti-science YAPPING. Your pitiful attempts to prove anything untoward is happening are really becoming a MASSIVE JOKE, seb. Same with Arctic sea ice, the ONLY time it has been higher than now has been during the LIA, and the late 1970’s which was up there with the LIA That means the current level is above what it has been for some 90-95% of the last 10,000 years. Both are ANOMALOUSLY HIGH, and have only recovered slightly from EXTREME HIGH LEVELS of the COLDEST period in the whole interglacial. 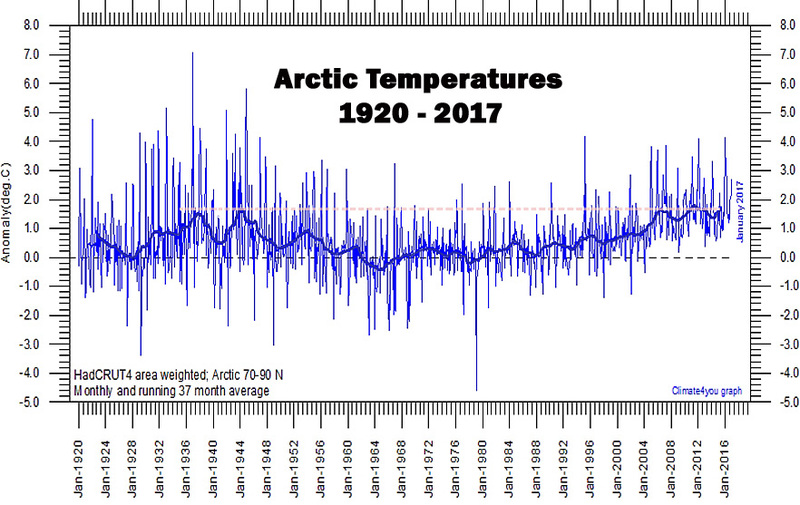 You keep putting up this graph and use it as if it would show ice mass. Why? You are right, seeing as the area is a squared unit, and volume cubed, the volume curve would have a much more pronounced dip through the middle of the Holocene..
That’s for pointing that out, seb. And seb takes yet another trip down FANTASY LANE !!! People use those sort of expressions when they HAVEN’T GOT A CLUE what they are talking about. You being one of those, seb. ROFLMAO.. By what? FAILED climate models.??? Those climate models have underestimated the current increase in heat content (and therefore overestimated the increase in air temperature). As a consequence, they have underestimated the sea level rise. So the extra 2 mm/yr of sea level rise added onto the 1.45 mm/yr from adding all the contributors together to make 3.4 mm/yr (NASA) is caused by a modeling error that wildly underestimates thermal expansion’s contribution to sea level rise? Have you mentioned this egregious error to the scientists, SebastianH? If not, you’ve got a lot of work to do, because it’s widely accepted that thermal expansion only contributes about 0.6 to 0.7 mm/yr to sea levels, not 2.5 mm/yr, as you apparently believe. How do you know that you’re right, and all the scientists (on your side) are wrong? Any change in OHC is totally immeasurable, its all just agenda driven modelling. ARGO buoys, before adjustment, show ocean COOLING. If only scientist would notice their mistake and be as smart as you. Maybe you should write them a letter or something and let them know? Speaking of, you apparently claim that the models underestimate thermal expansion’s contribution to sea level rise by a factor of 3 (scientists say it’s 0.65 mm/yr, but if the altimetry rates are correct, as you believe they are, thermal expansion’s contribution would need to be about 2 mm/yr). Why do you think the models have gotten it wrong for so long? The MOST ACCURATE visualisation of the effect of that “estimated/guessed” 9 trillion tonnes of ice is given by the picture of those two coins at the top of the post. Anything else is just a child-minded, anti-science fantasy… As expected. Probably … but then those trying to visualize the rise in sea level need 10-20 coins for the whole increase. Fine with me. A U.S. nickel is 1.95 mm thick. Two nickels together are 3.9 mm thick. That’s how much contribution (3.9 mm, or 0.39 of a centimeter) to sea level rise from the Greenland ice sheet there’s been between 1993-2010. So why did you make up your “10-20 coins” visualization? 3.9mm is 10-20 coins is it? You always did have issues with basic maths, didn’t you seb.!! The sea level didn’t just increase by 3.9 mm in those years, that’s just the contribution of Greenland if those measurements/observations are correct (the IPCC report has Greenland’s contribution at 0.43 mm/yr from 1993 to 2010; ice sheet plus glaciers). What has a political report got to do with science? Those “in the know” that can use a calculator can easily see what 9 trillion tons of ice are compared to the whole mass of all ocean water and can roughly say how much sea level rise that would result in. According to Levitus et al. (2012), the rate of rise due to thermal expansion during 1955-2010 was 0.54 mm/yr. So it’s probably fair to say that thermal expansion contributes about 0.6 to 0.7 mm/yr of sea level rise. Between 1993 and 2010, Greenland contributed 0.23 mm/yr (3.9 mm/17 years). We add our observational estimate of upper-ocean thermal expansion to other contributions to sea-level rise and find that the sum of contributions from 1961 to 2003 is about 1.5 ± 0.4 mm yr-1, in good agreement with our updated estimate of near-global mean sea-level rise (using techniques established in earlier studies) of 1.6 ± 0.2 mm yr-1. Extending the sea level record back over the entire century suggests that the high variability in the rates of sea level change observed over the past 20 years were not particularly unusual. The rate of sea level change was found to be larger in the early part of last century (2.03 ± 0.35 mm/yr 1904–1953), in comparison with the latter part (1.45 ± 0.34 mm/yr 1954–2003). So, SebastianH, having established that the primary contributors to total sea level rise only add up to 1.5 mm/yr when combined, why do you think it is that NASA has claimed that sea levels are rising at a clip of about 3.5 mm/yr, or more than twice the itemized rate? Where is that “extra” sea level rise contribution emanating from? Do you know? thermal expansion is less than that modelled by climate modellers like Levitus. having established that the primary contributors to total sea level rise only add up to 1.5 mm/yr when combined, why do you think it is that NASA has claimed that sea levels are rising at a clip of about 3.5 mm/yr, or more than twice the itemized rate? Where is that “extra” sea level rise contribution emanating from? Do you know? Read other papers or the IPCC report (chapter 13, page 1151) and you’ll see the contributors to the observed sea level rise of (3.2 mm/yr in the last decades). Or do you believe the instruments measurements are incorrect? The satellite data is in the hands of RABID alarmists, who have been adjusting the trend upwards basically since 2000. Synopsis: Sea-level is not rising everywhere. The measured rate of coastal sea-level change varies from -17.59 mm/yr at Skagway, Alaska to +9.39 mm/yr at Kushiro, Japan. The average, as measured by the world’s best long-term coastal tide gauges, is just under +1.5 mm/yr (about 6 inches per century). Some sources quote much higher rates, sometimes as high as 3.3 mm/yr (13 inches per century), based on satellite altimetry measurements of sea-level, rather than coastal sea-level measured by tide gauges. That is a mistake. Most fundamentally, satellite altimeters measure the wrong thing. Their measurements are distorted by “sea-level rise” caused by thermal expansion when the upper layer of the ocean warms. But that is a strictly local effect, that doesn’t affect the quantity of water in the oceans, and doesn’t affect sea-level elsewhere (e.g., at the coasts). Sea-level rise only matters at the coasts, but satellite altimeters are incapable of measuring sea-level at the coasts. They can only measure sea-level in the open ocean. Tide gauges measure sea-level at the coasts, where it matters. Also, tide gauge measurements of sea-level are much higher quality than satellite altimetry measurements. The satellite measurements of sea-level are of questionable reliability, and vary considerably from one satellite to another. Also, some of the tide-gauge records of sea-level measurements are nearly ten times as long as the combined satellite measurement record, and twenty times as long as any single satellite measurement record. You really should WAKE UP to the agenda driven maleficence of your alarmista scammers. But you are in a deep GULLIBLE sleep. Add this to the list of stupendously stupid analogies concocted by climate alarmists. 4! Hiroshima! Bombs! Per! Second! …the ice that’s left to melt is high latitude and high altitude, which will melt slower than what caused the rapid sea level rise after the last ice age. Another point is that Canada is no longer under 2 miles of ice. There’s a lot LESS ice to melt. Finally, the fastest sea level rise for all that ice melting averaged about 1.5 meters per century. It can not only not exceed that today, it can’t even come close. I enjoy reading what Nils-Axel Mörner has to write on the topic. He’s got some great videos, as well. Sorry, this is the link to what N-A M (and others) write on the topic. Leftist politicians, “journalistas,” climate “scientistas,” etc., etc. None of them are any good. Here’s a bullet I hope my German friends can dodge. Of course if you haven’t an alternative, I don’t see how. Still, I’m hoping for the best for you. Out of curiosity I looked up the mean radius of the Earth and calculated the surface area in square metres. Took 71% of this as sea surface area, assuming 1 metre of water, multiply by 1.1 to get ice volume and find a rounded figure of 400,000 CUBIC KILOMETRES of land ice must melt to raise sea level by just 1 metre. Then calculate the energy required to convert ice to water at zero degrees C, never mind ice at minus 30C, and try and figure out how this energy gets to the Greenland ice over any time scale given for the pending doom. There would be no life on Earth if that volume of ice melted in just 10 years. I am curious … what amount of energy did you get as a result of your calculations? Was it in the range x*10^24 Joules? The isothermal melting of ice requires some 334 kilojoules per kilogram at 273.16 K. That figure applies only to the change of state from solid to liquid between the temperatures of -0.01C to +0.01C (or from 273.14K to 273.16K). 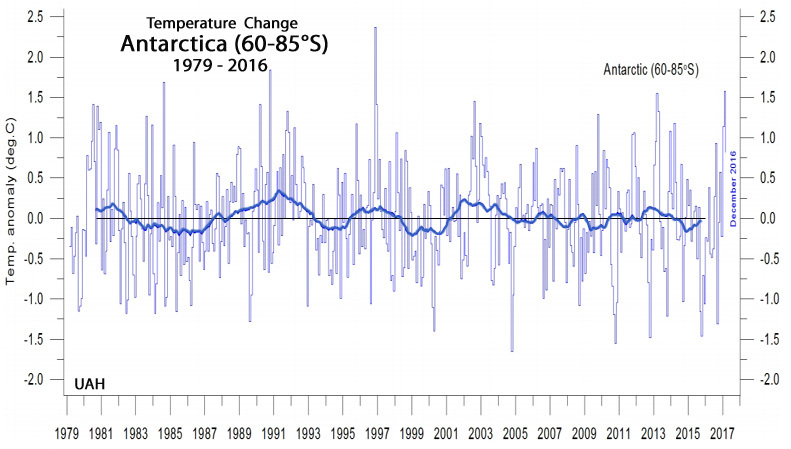 But most of the ice on Antarctica is way below this temperature (like -50C) and for every degree below freezing each kilogram of ice will require a further average of some 2 kilojoules per degree more. To cut a long story short I reached the grand total of 121,454,545,500,000,000,000 kilojoules of energy. The next problem was how to deliver this energy to the ice. Can’t use the sea, the ice is on land! I picked a time scale of 20 years, (twice the then alarmist time of 10 years) and derived a figure of 20,000 WATTS PER SQUARE METRE! 20,000 WATTS PER SQUARE METRE! Between 2000 and 2010, Feldman et al. (2015) estimate (modeling) that the radiative contribution from the +22 ppm increase in CO2 was a paltry 0.2 W m-2. It’s a little difficult to imagine that 0.2 W m-2 could compete with the amount of energy it takes to thermally expand the ocean waters. 0.2 W/m² increase per decade over 20 years results in an average forcing of 0.2 W/m² or 6.4 * 10^22 Joules of additional energy in the system (heat content). Of course, there is also the forcing from the previous increase of the CO2 concentration in previous decades. Woah. 0.2 W m-2. That would not appear to be significant compared to 6.8 W m-2 of additional shortwave forcing due to the reduction in cloud cover since the 1980s. Or extending it back to 1979 and up to 2011, it’s 2.3 W m-2 of additional solar heat absorbed by the climate system due to the reduction in clouds. [T]here has been a global net decrease [of 3.6%] in 340 nm cloud plus aerosol reflectivity [which has led to] an increase of 2.7 W m−2 of solar energy reaching the Earth’s surface and an increase of 1.4% or 2.3 W m−2 absorbed by the surface [between 1979 and 2011]. These values completely overwhelm your alleged 0.2 W m-2 from CO2, which, unlike direct SW radiation, hasn’t even been observed heating the ocean waters. CO2 “radiative forcing” can’t even penetrate past the hair-thin ocean skin layer, whereas SW radiation heat can penetrate 10s of meters into the ocean. Says seb , who is STILL totally unable to produce one bit of scientific proof for the very basis of his scam AGW religion. Only one with the FANTASY FIZZICS is you , little child-mind. but you would probably relate more to this one. If that (6.8 W/m²) would be a net forcing but it’s not. You conveniently left out the last part of the sentence you quoted from the second paper “[…] which is partially offset by increased longwave cooling to space.” At least the authors mention that it’s not the whole story. And don’t start with your “I don’t understand how CO2 could ever heat the oceans” stories about it not being able to penetrate the surface. At least try to understand the mechanism, you don’t have to agree that it works that way. You conveniently left out the last part of the sentence you quoted from the second paper “which is partially offset by increased longwave cooling to space.” At least the authors mention that it’s not the whole story. The “partially offset” (key word, partially) value would appear to be rather minor when considering that 2.7 W m-2 of additional solar radiation from cloud cover reductions reached the Earth’s surface between 1979-2011, whereas 2.3 W m-2 was actually absorbed by the surface (oceans). The “partially offset” amount is but a small fraction of the additional solar energy absorbed from natural variations in cloud cover. And 2.3 W m-2 is still quite a bit larger than the alleged 0.2 W m-2 from CO2. And don’t start with your “I don’t understand how CO2 could ever heat the oceans” stories about it not being able to penetrate the surface. Why did you put quotation marks around a sentence that I never wrote, and then dishonestly assert that I actually wrote that? Why not just quote what I actually DID write? Do you deny that heat from CO2 cannot penetrate past the 1 mm “thick” skin layer? Do you deny that solar radiation can penetrate past the skin layer to heat the first 10s of meters of the ocean? Do you deny that variations in the amount of absorbed solar radiation (+2.3 W m-2 between 1979 and 2011) would be far more consequential in determining ocean temperatures than tiny (alleged) 0.2 W m-2 CO2 forcing that can’t even penetrate past the skin? So 1.215 * 10^23 Joules … that’s about half the increase in ocean heat content in the last ~30 years. Secondly, you don’t need to melt the ice uniformly over the whole continent. The additional heat in the ocean and atmosphere would move the melting zones a bit inland. The complete collapse of the West Antartic Ice Sheet alone would increase the sea level by about 3.3 m (https://www.klimafakten.de/sites/default/files/science_bamber_etal_2009_wais_sealevel-3.pdf). 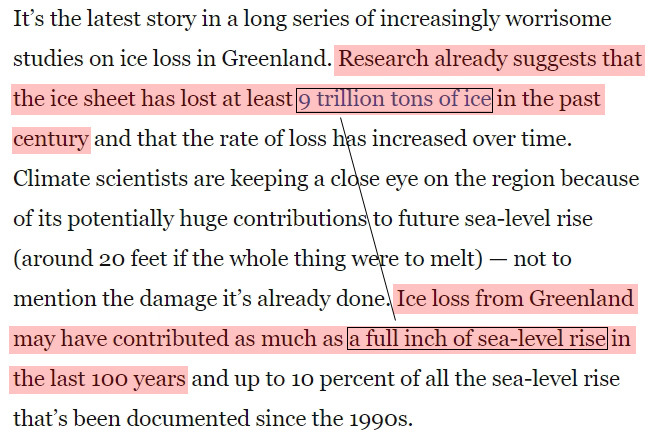 And if Greenland’s ice were to all melt, it would raise sea levels by 20 feet. You have fully absorbed all the catastrophic fantasy scenarios that have no relation to reality. Not only that, but neither the Arctic region as a whole…. …has warmed in concert with CO2 emissions. The entire conceptualization has not been following climate models predicated on the assumption that CO2 emissions from humans is what warms ice and causes glaciers to melt. The models have failed. And we know from Zwally that Antarctica is actually GAINING ice by a tiny amount..
You really have to STOP snorting that ice, seb, it is diminishing your mental capacity, and you had precious little to start with. Sebastian, do you now understand why Antarctica glacial ice and Snow is not in danger of melting away on us? What is the danger that you believe is likely to happen, SebastianH? ROFLMAO, linking to a rancid, anti-progress, zero-science, climate activist site. No wonder you are so very confused about what real science is. !! Models,models and more models into the future. An additional fact for justthefacts: sea ice extent doesn’t have a simple direct relationship with ocean current temperatures. It is unwise to draw conclusions about the health of an ice shelf based only on the extent of sea ice around it. Mass loss from ice shelves is primarily driven by basal melting from warm (relatively speaking) water, and to a lesser extent calving. That means basal melt rates (derived from changes in surface elevation) and calving rates would be better things to use to draw conclusions about the temperature of the deeper water (which is hard to measure directly) and the health of ice shelves. But apparently you believe simply looking at sea ice extent is all you need to do to declare “there are no apparent signs of the “warm ocean currents” “. I don’t think that simple assertion has much factual support. Oh, but you have provided cogent evidence for “that assertion” with your links. Ocean waters melting the undersides of Antarctic ice shelves are responsible for most of the continent’s ice shelf mass loss, a new study by NASA and university researchers has found. The ice shelves are growing, and your links each says that warm ocean currents under the ice are the major cause of “ice shelf mass loss”. Thanks for providing such clear evidence that your assertions are rubbish. I think you are mixing up the Arctic that has warm water from the Gulf Stream head in its direction vs the Antarctic with its Antarctic Circumpolar Current or ‘West Wind Drift’ that completely isolates the Continent form waters from the equator. The opening of Drake Passage at the tip of South America (Cape Horne) allowed this current that completely circles the continent to form plus the closing of the Isthmus of Panama is thought to be the geologic events that sent the earth into the present ice age. From another source that I trust a heck of a lot more, Maritime Safety Information CHAPTER 31 OCEAN CURRENTS: TYPES AND CAUSES OF CURRENTS I start at the beginning of the passage which talks of the southern Atlantic. The chapter also has a map that shows that some of the cold water heads up along the west coast of South America. And it show the West Wind Drift as COLD water going round and round the continent of Antarctica. …That branch of the South Equatorial Current which curves toward the south off the east coast of South America, follows the coast as the warm, highly-saline Brazil Current, which in some respects resembles a weak Gulf Stream. Off Uruguay it encounters the colder, less-salty Falkland or Malvinas Current forming a sharp meandering front in which eddies may form. The two currents curve toward the east to form the broad, slow-moving, South Atlantic Current in the general vicinity of the prevailing westerlies and the front dissipates somewhat. This current flows eastward to a point west of the Cape of Good Hope, where it curves northward to follow the west coast of Africa as the strong Benguela Current, augmented somewhat by part of the Agulhas Current flowing around the southern part of Africa from the Indian Ocean. As it continues northward, the current gradually widens and slows. At a point east of St. Helena Island it curves westward to continue as part of the South Equatorial Current, thus completing the counterclockwise circulation of the South Atlantic. The Benguela Current is also augmented somewhat by the West Wind Drift, a current which flows easterly around Antarctica. As the West Wind Drift flows past Cape Horn, that part in the immediate vicinity of the cape is called the Cape Horn Current. This current rounds the cape and flows in a northerly and northeasterly direction along the coast of South America as the Falkland or Malvinas Current…. John Englard, is an Environmentalist Journalist with NO science background and no ability to make an honest presentation. At WUWT site he attacked,has a bunch of comments showing what John repeatedly left out. Do better Sebastian…. if you can. Come on Kenneth, he is being extremely stupid on this, because over 90% of the Continent is NEVER above freezing,surrounded by a circulating cold sea water. It doesn’t occur to warmist loons that Ice shelves extending far out into the ocean eventually break, up as they are subjected to ocean currents all the time. He goes to a “Citizen Journalist, who leaves out a lot of actual science to push his idiotic “Antarctica is in big danger”, lets scream and cry about it for a while. It is boring to hear them cry wolf a thousand times. Thanks, I enjoyed the joke. That link source with all those nice graphs, looks almost like the real thing until you look at the scales they’ve used. Hahahahah! That MUST be from COO2 black-radiation penetrating the ice and heating the rocks underneath. https://gracefo.jpl.nasa.gov/resources/33/ (Greenland losing 281 Gt of ice per year). @tom0mason: what’s wrong with the scales? 1878 Gt ice loss in Antartica and 3148 Gt ice loss in Greenland aren’t exactly small figures. You only need to melt 370 Gt ice to increase the sea level by 1 mm on average. Apparently Sebastian, is unaware of GRACE problems,as they make their determination using MODELS to create their charts. Your two links used deceptive time series coloring making it look like massive meltdown is happening. What is a “deceptive time serious coloring”? https://climate.nasa.gov/vital-signs/land-ice/ for more up-to-date data. Apparently, sunsettommy is unaware that measuring ice extent isn’t telling the whole story and that the best instruments for measuring actual ice mass, are satellites. a) this is the highest temperature for y thousands of years (fill in the time of your choice). b) They quote temperatures and CO2 levels from the ice cores for the past 800,000 years, which show no melting of the ice shelf. Seriously, wannabe Kommander Bragg and his ilk need help – probably starting with a long lie down in a darkened room followed by an intensive de-indoctrination programme ie. proper schooling in the Scientific Method with thrice daily administered doses of reality (unfortunately now an increasingly scarce commodity…). (Big h/t too to Kenneth Richard for links, etc. to an increasing wealth of papers.). Ah, maybe NTZ doesn’t allow video links; the excluded link was to Bragg’s ‘King Tide and the Sunny Day Flood’. Part of a series, too!